Here is a quote from that downloadable free book on drawing by Harold Speed I mentioned previously. He says that when a child draws a picture that they are drawing what they feel (as in sense of touch) more than what they actually ’see’. The image is from the book. 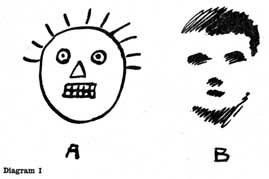 Image A is type of first drawing made by children and Image B is what might have been expected if the “crudest expression of visual appearance had been attempted”. If even remotely close to the truth, it is no wonder we need to learn how to draw what we see! Things have been quiet on the blog lately due to the holiday season and because of self inflicted computer ‘issues’. It seemed like a good time to rebuild a machine so I rebuilt not just one, but two workstations. And both had problems. In the big picture they really weren’t that big a deal, but those kinds of things can sure lead you to have tunnel vision and so make the problems seem bigger than they really are… note to self: remember the big picture. I upgraded one workstation so that it could run the new PCI Express SLI 7800 video cards, and after a bit of a struggle (ok, so it was more than a ‘bit’) I settled on an ASUS A8N32-SLI motherboard. Not that this board was a struggle. It is an awesome board and the video card (an 7800GT) is great too! It runs Maya, Max and Lightwave like a dream (not to mention ‘Call of Duty 2′!). I had originally wanted to save a few dollars and so I tried out a generic brand motherboard – well after 8 hours of fighting with it to make it try to recognize SATA drives – I exchanged it for the more ‘reputable’ board. Now all I need to do is wait for the 7800GT video card to drop in price so I can buy another card and enable SLI (Scalable Link Interface). This is the technology that allows you to link two video cards together so they share the load when making the image (that’s the equivalent of a dual processor computer, except it’s a dual GPU – graphics processor unit) – wow… who would’ve thought (ok, so only a nerd could really appreciate that). Speaking of nerds – I’ve been messing around with C++, DirectX, Vertex Shaders, and all of that other left brain neato stuff. It’s amazing what the GPU can do… so much of the graphics work can now be offloaded onto the GPU. When I get the additional card the workstation will have two CPU’s (AMD 64) and two GPU’s (7800).Very cool (or hot!). Oh oh… now the workstation won’t be the bottleneck! So that was workstation number 1 – a big sigh of relief after that experience. For workstation number 2 I took the original motherboard from workstation 1 and rebuilt it – only one problem – well it actually turned out to be two problems. When I put it all together the machine wouldn’t even POST (Power On Self Test). That’s a big issue – it essentially means something is very, very wrong. The only thing that happened is the fans turned on – and that wasn’t even consistent. Sometimes it would power up, sometimes not. Computers – it’s a love/hate thing. When things are great – they are a great tool. But when things go wrong – well suffice to say I considered changing vocations and becoming a sheep farmer. Anyway, it turned out to be a flakey power supply (why can’t they make ATX power supplies with the same number of pins on the power connector – 20 or 24… argh!). Not only that, but it didn’t like the memory combination I was using (even though all 4 DIMMs were identical brand and specs). It took two of the DIMMs, but any additional sticks and it would fail the POST. I think it has something to do with the fact that it’s dual channel and the memory isn’t quite fast enough. It’s bad enough when a computer has one problem, but when it has two problems that’s a lot more of a headache. Anyway, that workstation is humming along nicely now. Back to re-installing all the software! My New Year’s resolution, you ask? Don’t mess with a working workstation . Happy New Year! Here is something to add to the toys you received this Christmas. You may need to install Java to play with it. Well, I finally went to see the movie the other day. I had high expectations going into the film, and it didn’t let me down. Well done Rhythm and Hues! Aslan was amazingly done. I think it’s at the top of my all time favorite movies list. Not because of the special effects (I mean Golem was done very well in Lord of the Rings – and just like Aslan, it was tough to tell he was CG), not because of the acting (even though it was quite good), not because of the cinematography (quite well done), but mainly because of the story. More specifically the analogy that C.S. Lewis based the story on. The analogy of Christ’s taking upon himself what we so justly deserve. How appropriate that it was released just before Christmas. On that note I wish you all a Merry Christmas and a Happy New Year! Ok, here is an interesting read (under Where The Money Comes From). It’s sort of a ‘follow the life cycle of revenue’ of a film. “The whole purpose of theatrical release is to get as close to break-even as possible…” Ack… break even on the theatrical release? Interesting reading. So here is an illustrator who really has a cool style! I wanna be just like him when I grow up. I just love how he uses the line and charicaturizes the characters. What a gift! You can check out his blog, his website and an interview with him. 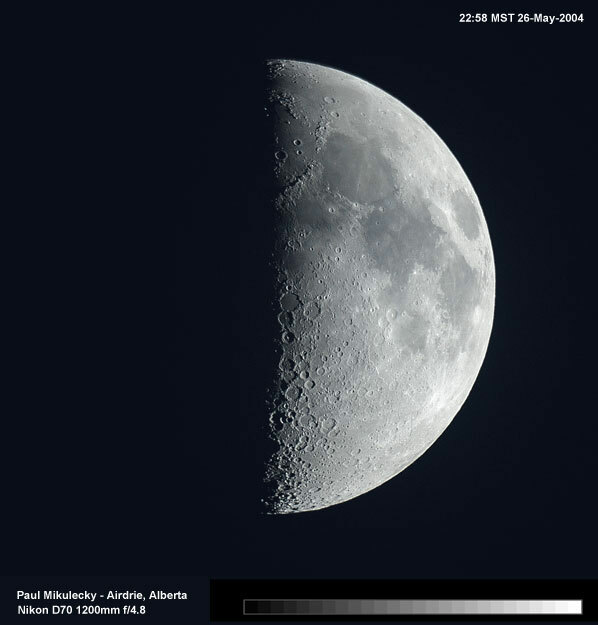 This is a photograph I took of the moon back in May (click on image for larger photo – for best viewing make sure you can see the greyscale gradations on the bottom of the photo by adjusting your monitor brightness). I enjoy photography and I also enjoy astronomy. I have a 10″ Newtonian telescope I like to wrestle with on a clear night when I know I don’t have to get up early in the morning (which has been rare in the last 6 months). As for photography I think that every artist should be a photographer (either with the mind’s eye, or with a camera). It helps with learning composition, staging, and is useful for reference. Plus it’s a lot of fun! I think I’ll be including more photos in the future. Please let me know what you think! My friend Bill Jacoby has entered the blogsphere!! His blog is worth a visit! In the last couple of days he’s been talking about artists and fear. I think we can all relate. Now this is taking character development seriously! Ok, I think Scrat has to be one of my favorite 3d characters out there… the perserverence of that critter! If you haven’t seen the latest trailer, Apple has some high definition versions here!